Hey, hey! 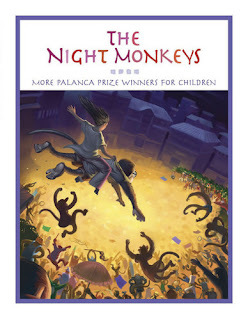 The launch for The Night Monkeys: More Palanca Prize Winners for Children (Tahanan Books) is on June 30, 2008 at 7PM (that's a Monday). Come on over to Mary Grace Café at Serendra, Fort Bonifacio Global City and join the celebration. Nikki Alfar has a story in the antho, as well as Raissa Rivera-Falgui, Natasha Vizcarra, Luis Katigbak, Yvette Tan, Cyan Abad-Jugo, Herb Fondevilla, Celeste Flores-Coscolluela, Honoel Ibardolaza, and Bing Sitoy. Just look at that cover - I love it!